Avery Publishing Group, 9781583334683, 285pp. With candor and humor, a manic-depressive Iranian-American Muslim woman chronicles her experiences with both clinical and cultural bipolarity. Melody Moezzi was born to Persian parents at the height of the Islamic Revolution and raised amid a vibrant, loving, and gossipy Iranian diaspora in the American heartland. When at eighteen, she began battling a severe physical illness, her community stepped up, filling her hospital rooms with roses, lilies, and hyacinths. But when she attempted suicide and was diagnosed with bipolar disorder, there were no flowers. Despite several stays in psychiatric hospitals, bombarded with tranquilizers, mood-stabilizers, and antipsychotics, she was encouraged to keep her illness a secret--by both her family and an increasingly callous and indifferent medical establishment. Refusing to be ashamed, Moezzi became an outspoken advocate, determined to fight the stigma surrounding mental illness and reclaim her life along the way. Both an irreverent memoir and a rousing call to action, "Haldol and Hyacinths "is the moving story of a woman who refused to become torn across cultural and social lines. Moezzi reports from the front lines of the no-man's land between sickness and sanity, and the Midwest and the Middle East. A powerful, funny, and poignant narrative told through a unique and fascinating cultural lens, "Haldol and Hyacinths "is a tribute to the healing power of hope, humor, and acceptance. Melody Moezzi is an Iranian-American Muslim activist, attorney, writer, and award-winning author. She is a UN Global Expert and a blogger for "The Huffington Post "and "Ms." magazine. Moezzi is also a featured columnist and blogger for "Bipolar Magazine, "and her writings have appeared in "The Washington Post, The Guardian, The Christian Science Monitor," and many other publications worldwide. She has provided commentaries for CNN, NPR, BBC, HLN, PRI and other media outlets. She lives in Raleigh, North Carolina. "Blistering, brash and irreverant... [Moezzi's] courageous postcard from the edge can't come too soon." "[W]hipsmart but whimsical…Moezzi's fierce honesty and comic self deprecation bind together winningly." 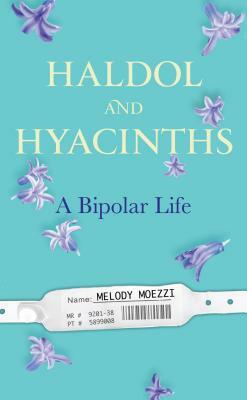 "A captivating autobiographical account of [Moezzi's] struggle with bipolar disorder." "At times moving, usettling, and funny, Moezzi's brash, barely filtered memoir is a fascinating glimpse into a tumultuous mind." "Moezzi is brutally honest...[and] bitingly funny in her narrative." "Iranian-American story with a feminist bipolar twist." —Tyler Cowen, New York Times Magazine "One-Sentence Book Review"
"[A] must-read autobiography... informative and uplifting." Shocked to find there wasn’t another Iranian-American Muslim bipolar feminist memoir on the market, I just had to fill the void in the literature. Seriously though, I’m a human rights activist. I’ve fought for the rights of Iranians, Muslims, women, the LGBT community and other marginalized groups for years. After being diagnosed with bipolar disorder, I suddenly became part of this new wildly persecuted and painfully silent minority, and for the first time in my life, I was ashamed of a piece of my identity. I was brought up to be proud of who I am and never hide my background, no matter how unpopular it might make me. But now everyone was telling me to be quiet, and while I may have been ashamed and afraid at the time, I’ve never been the quiet type—particularly where injustice is concerned. Soon enough, the activist in me came out, and I spoke up. After writing commentaries for NPR, CNN and other media outlets about my mental illness, I received hundreds of messages of support encouraging me to continue writing and speaking about the issue. I promised my readers and myself that I would, and Haldol and Hyacinths is my fulfillment of that promise. I pray this book will help chip away at the shame, fear and stigma that so many people living with mental illness face on a daily basis. When were you first diagnosed, and how did you react? I was diagnosed in late 2008, thanks to an acute manic episode. Being manic, psychotic and confined to a hospital isolation room at the time, my first reaction was to call my captors crazy. I was convinced that none of my recent beliefs or behaviors was remotely strange, let alone mad. Not disrobing in public, not announcing I was a prophet, not threatening to fight strangers or spending hundreds of dollars on Doritos, Oreos, ice cream and candy bars. It wasn’t until the Haldol started to kick in when I realized that I might have been a little—okay, a lot—crazy. Unlike me, they accepted the diagnosis right away. My husband is the smartest and most rational person I know. My parents and my sister are pretty sharp too and happen to be physicians. They all immediately acknowledged and respected the science. I got lucky there. Still, it took them time to get over the stigma, as they consistently encouraged me to keep my illness a secret. Thankfully, however, they got over that shortly after I did. Having a bright and supportive family has been a huge blessing. None of them has ever suggested that I could pray this away or that I was making it up or that I was possessed by demons or Smurfs or some other nonsense. Sadly, that’s a privilege few people with mental illness can claim. You wouldn’t believe the stories I’ve heard from people with family members who, bless their obtuse hearts, just don’t get it. How do you treat/manage your bipolar disorder? I take a mood stabilizer and an antidepressant daily. I try to eat well, exercise and maintain a fairly regular sleep schedule. I take an antipsychotic on the rare occasions when I start hearing or seeing things that aren’t there, or when my thoughts start racing fast enough to render my speech unintelligible. You discuss your religious and activist beliefs in the book. Do you see similarities in religion and activism? To me, religion and activism are one and the same. This book is an expression of my personal jihad—that is, my struggle to fight oppression. In this case, that oppression manifests itself as discrimination, fear, stigma and shame, and as a Muslim, it’s my moral duty to stand against it. That’s what I’m doing with this book. I didn’t particularly want to share my story. I didn’t particularly want to put all my crazy out there for the world to see and judge. I didn’t particularly want to relive all that trauma and madness. But silence is its own form of oppression, and I don’t particularly want to be a coward either.